Shock announcement of the year: not everyone loves Christmas trees. Some of us find them too much faff to put up; others are just plain bored of same old year in, year out; others simply don't have the space. If you'd like an alternative, you're in luck: we have scoured the world of festive offerings for cool and unusual ideas – guaranteed to stir up enthusiasm. Best of all? If you LOVE Christmas trees, these make a great addition to your traditional tree, too. Find more Christmas buys and gifts on our dedicated page. Is now a good time to mention our list of the 10 best artificial Christmas trees? Another understated ornament, the Chalk Pre Lit Twig Tree from Lights4fun is both elegant and cheerful, thanks to the warm LED lights. Stick it by the front door, in the back garden – or bring it inside for a contemporary Christmas look. The easiest option of all – and a very budget-friendly one – is stacking wooden crates in the shape of a Christmas tree. Then, fill them with your favourite Christmas decor or gifts. Hey presto, a chic, boho Christmas tree alternative. Don't have any crates, or love the ones in the photo below? Get the Large Wooden Christmas Crate Tree from Plantabox. If you have small children, a tree can be too much of a hazard (people with naughty pets will get the dilemma, too). Instead, put up a child-safe teepee they'll love playing in, and decorate it with your favourite Christmas ornaments. This teepee has been decorated with Christmas treats from Dunelm. Forget buying stuff and have fun drawing your tree with your kids! If your children's room has a blackboard and some chalk, you're basically sorted. Just add Christmas decs. This kid's room has been decorated with Christmas goodies from Homesense. It's not all about fairy lights; why not edge it up a bit and go for neon lights instead? 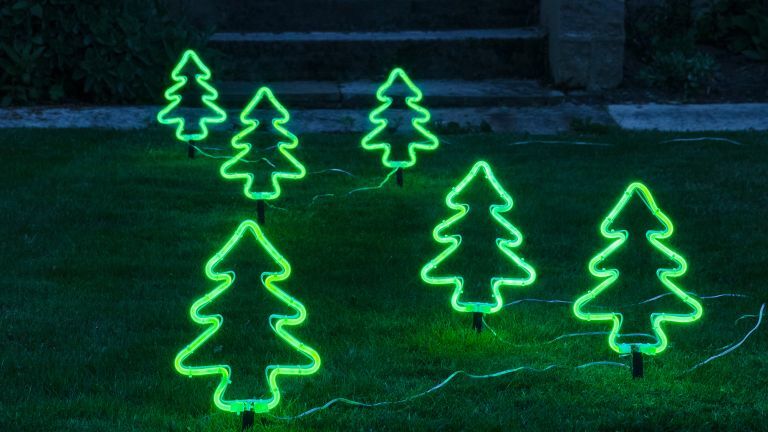 The Neon Christmas Tree Garden Stake Lights from Lights4fun are cool and different, if a little Twin Peaks. They cost £34.99 for a pack of three. Part joke, part cool design idea, using a step ladder to create a tree-shape for displaying baubles will delight your friends (but probably appal your grandma). Just make sure everything is stable – you might be better off laying a soft rug underneath, just in case your makeshift tree topples... and maybe avoid this idea if you have toddlers. This DIY ladder tree has been decorated with baubles from Poundland, but if you're considering it, it's definitely worth checking out our best kitsch tree decorations, just to finish off the tongue-in-cheek approach to perfection. For an even smarter look, why not decorate a ladder book shelf? Don't like any of the DIY options? The Multicolour LED Christmas tree from My Furniture is sleek and glitzy, and will look nice in a contemporary home. Plus, the only effort you'll have to make is to a) click and buy and b) take delivery and c) plug it in and switch it on. Simples. Perfect Christmas atmosphere with the help of a battery-powered wood carving? Easy, with an LED stag forest scene, available from Not On The High Street. Wreaths are a great compromise when you want something quite Christmassy, but don't want a tree. Our favourite is the Tree Shaped Wreath from House of Bath. Perfect for those who like a more abstract take on Christmas, the pop-up outdoor tree from Wilko is very understated, but still festive. Plus it takes up barely any storage space the rest of the year. Result. Don't really do Christmas at all? Just stick some fairy lights on some of your favourite house ornaments, and you're good to go. If it's tree-shaped, even better. We like the White Wishing Trees from Sue Ryder. Have yourself a boho merry Christmas. Don't have much space, or would you like your tree to be the dinner table centrepiece, without pine needles everywhere? Pick a compact and stable metal design, like the ingenious Metal Christmas Tree from Maisons du Monde (sold without baubles). Bring festive cheer into a small kitchen or living room with a mini tree. With very small trees, there's no need to look for a convincing spruce lookalike – you might as well go for something a bit more unusual and eye-catching, such as the very sparkly and pretty Silver Glitter Mini Christmas Tree from Lights4fun. Want to really cheer up your front garden – and the whole street? The Tree Rope light from B&Q is guaranteed to stand out. Mains operated. Want to get a bit creative? All you need is some double-sided sticky tape and your favourite decorations (obviously not glass ones, as they won't stick). This tree-shaped Christmas ensemble has been created by MYK Berlin.